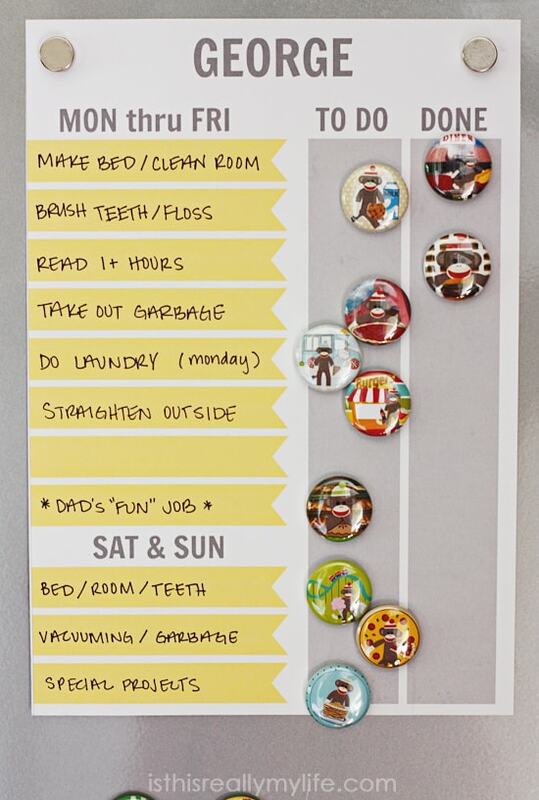 This FREE printable chore chart is perfect for magnetic boards and features sections for weekdays/weekends. Customizable and available in two sizes! 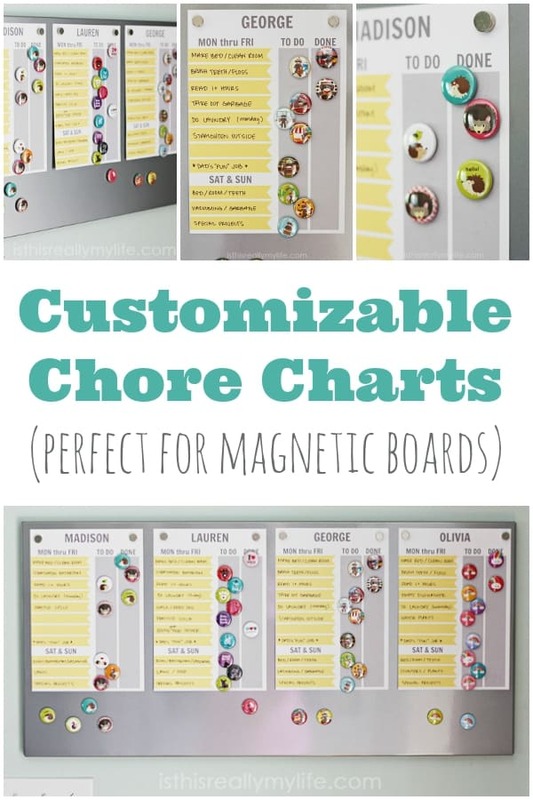 Before you get to thinking I’m super organized, this free printable chore chart was for the summer… and I didn’t put it on the magnetic board until mid July. School has been in session over a week now and I have yet to update them. It will probably be Halloween before I get around to it. Just sayin’. 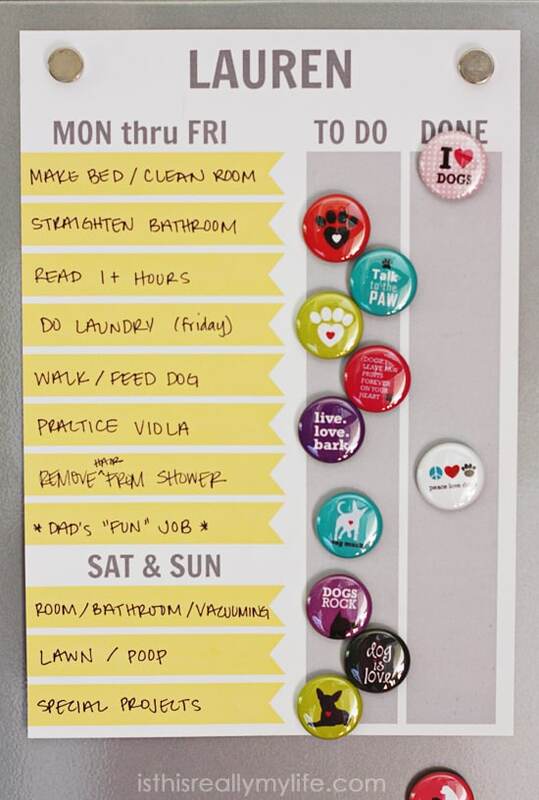 I got the idea for these magnet chore charts from Crafting Chicks but tweaked them to work better for our family. Weekends always vary from weekdays, and I found the individual IKEA magnet boards to be larger and heavier than I wanted. 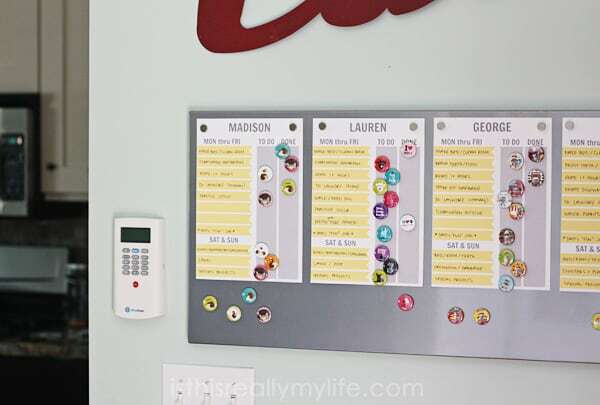 The single oversized IKEA Spontan magnetic board fit all four printable chore charts once I resized them, and the dimensions were a perfect fit for the wall next to the kitchen area. Plus the extra space beneath the charts leaves room for notes and reminders from Mom. If you don’t have an IKEA near you, this magnetic board has similar dimensions although it’s a bit pricier. 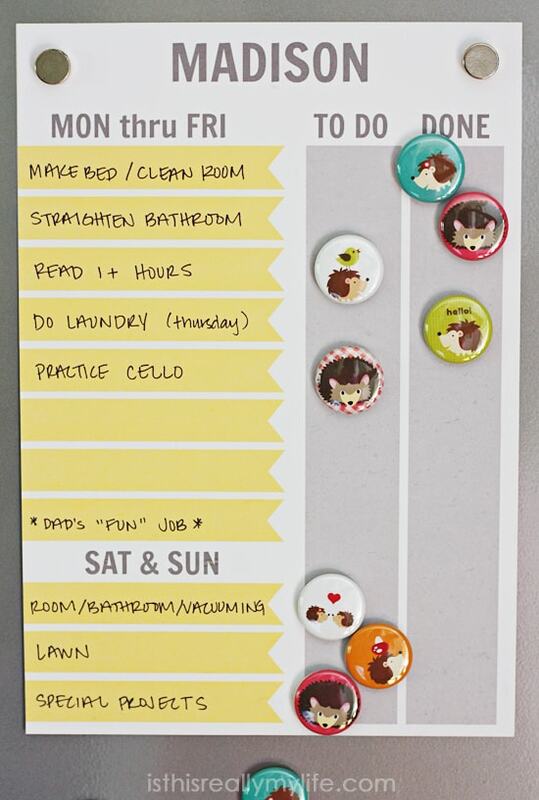 While my oldest two aren’t fans of the customizable chore charts—or that they’re visible to friends—they do use them. The possibility of losing their cell phone privileges keeps ’em on task. I changed the colors to yellow and gray so the charts were gender-neutral, and then I scoured Etsy for super cute magnets because we all know I’d be hard pressed to craft my own. 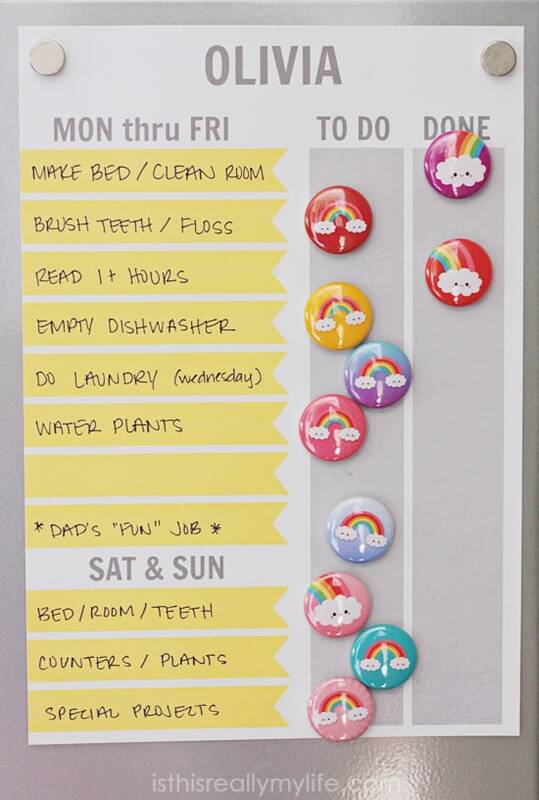 I found the most adorable button magnets from Cutebutton and ordered a set for each child. I think they’re my most favorite part of the chore charts. I mean, just look at those hedgehogs! 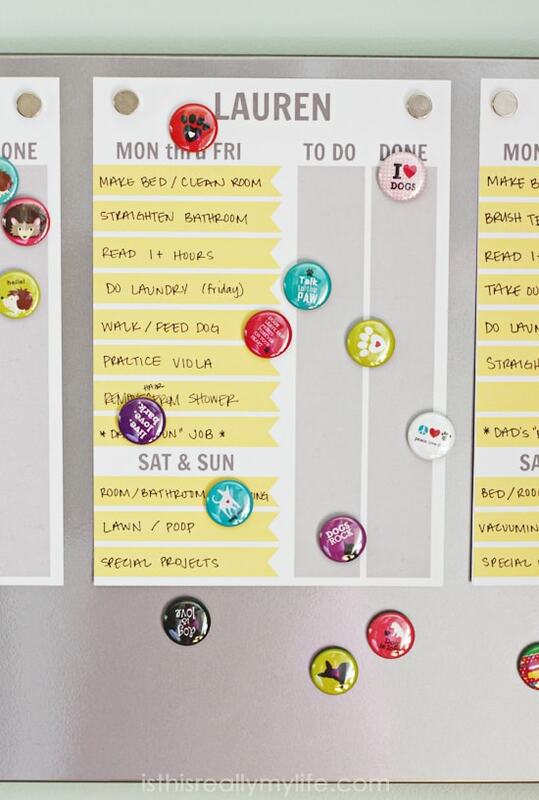 Here’s a closeup of each free printable chore chart so you can see just how cute those magnets are (and the kinds of jobs my kids were supposed to do this summer). You’ll notice the 1″ magnets are a bit large. I don’t mind them staggered when vertical, but if it bothers you, make sure you choose magnets smaller than 1″. 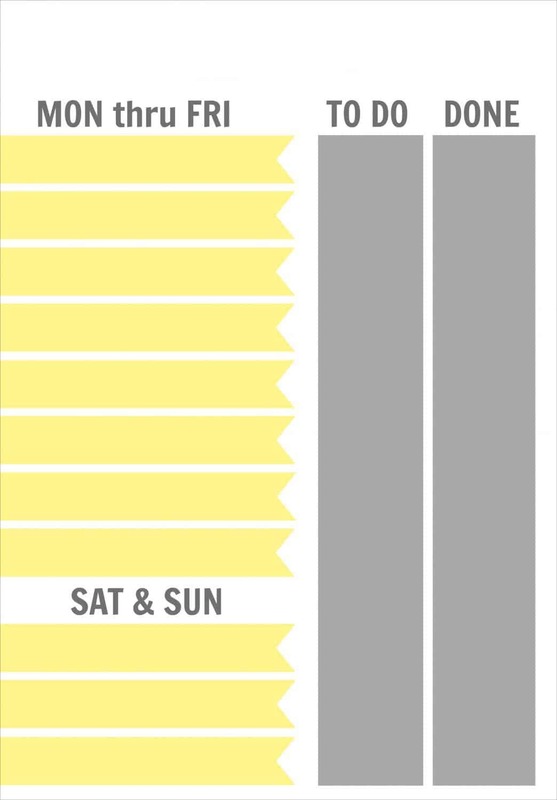 Here’s to hoping they’ll get into the habit of using the updated chore charts because contrary to popular (i.e., my kids’) belief, I don’t enjoy nagging. 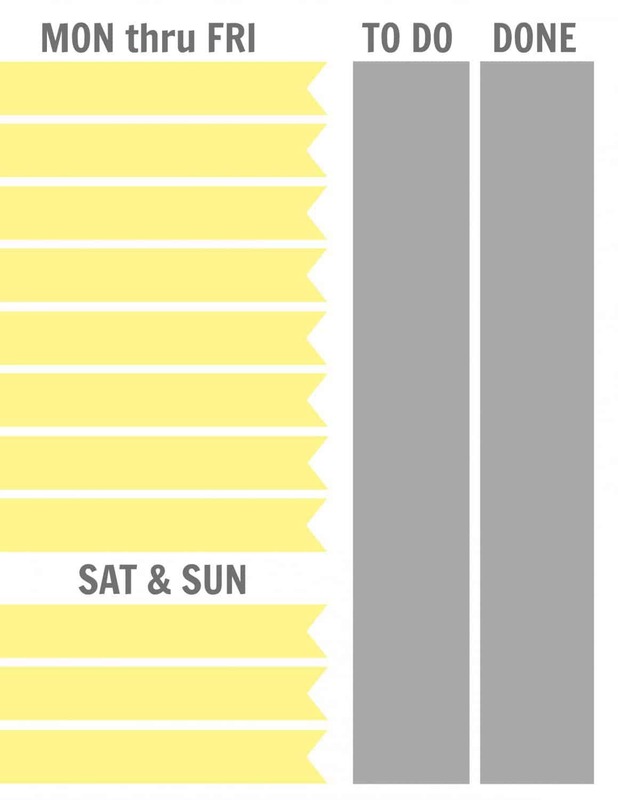 If you want to use these free printable chore charts, I have a couple options. And of course you don’t have to use them with magnetic boards; you could laminate them and use dry erase markers instead! This pack of low-odor dry-erase markers is my favorite. The first download is the printable chore chart in its original 8 1/2 x 11-inch size. It doesn’t have room for a name, but you could easily design a cute name tag to place at the top. 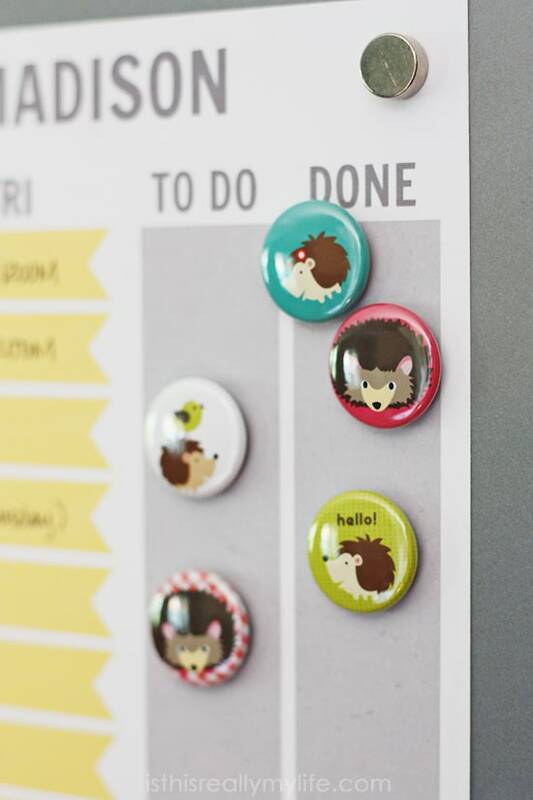 And this larger size is great for individual magnetic boards. If you’d like to place multiple charts on a magnetic board like the one I picked up from IKEA, you’ll want to download the 7 x 9-inch size. It will print on an 8 1/2 x 11-inch paper but I’ve added trim lines so you can cut it to size. Visit PicMonkey.com and click on Edit. Click on the text tool (Tt) and select the font Francois One. Type the name in the text box and then change the font size (I used 250) and position until it floats your boat. 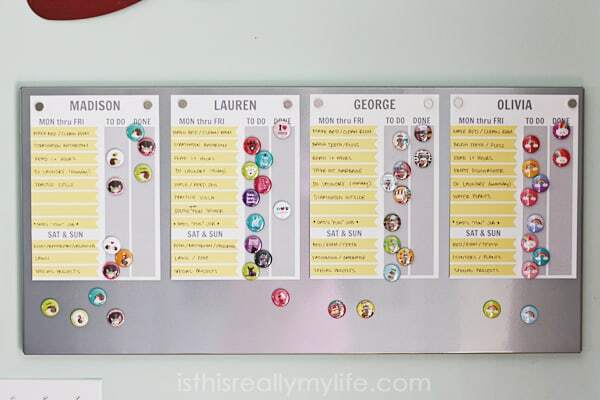 Save the chore chart as a new file. You can easily create multiple chore charts by editing the text box and saving each chart as a new file. You can even use the font tool to write specific jobs on the chart if you’d rather not write them by hand. I seem to always change what my kids need to do, so I went the easier route. I’m all easy button like that. Half-Scratched printables are for personal use only. If you decide to re-post or use the image on your blog or website, you MUST cite the source and include a link to this post. I love this because I just printed these off last week! We seriously should be neighbors. Well, DUH. We seriously should but you went and moved somewhere far away from Sandy. In the interest of full disclosure, I might have done that to Lauren chart. I think I’m missing something, I cannot seem to find where to click to download this printable. Thanks in advance for the help AND for the link to the Ikea magnet board! I cannot wait to get this going! No worries! You click on the image you want to print (either the smaller or larger size) and it should open to a PDF you can save to your desktop. The images are just before the “post script” at the end of the post. Let me know if you need more help! Hi, I wondered if you could change the colour from yello to pink if possible on the template? They are a JPEG so you can import them into an editing program like PicMonkey and easily change them. PDF files are often trickier to edit. I actually can’t click on the link for the charts at all. The links are at the end of the post. You click on the images and then save the JPG to your desktop. Here is the link for the 8 1/2 x 11: https://www.halfscratched.com/wp-content/uploads/2015/08/Job-Chart-Template-8.5-x-11.jpg and here is the link for the 7 x 9: https://www.halfscratched.com/wp-content/uploads/2015/08/Job-Chart-Template-7-x-9.jpg. Hope that helps!